Glen Breton is a fascinating case of cultural transliteration. Davin De Kergommeaux writes a chapter about Glenora Distillery and Glen Breton (and the "battle of the Glen" over the lawsuit concerning the use of the word "Glen" on a non-Scottish malt whisky) in his superb book Canadian Whisky: a portable expert. The gist of the story is that the region of Canada where Glenora is located - out in the Northern part of Nova Scotia (literally "New Scotland") on what's known as the Cape Breton Island in a rugged area that looks just like Scotland; has the same climate as Scotland; and is chock full of migrated actual Scottish people. The Glenora distillery carefully crafts a malt whisky that is as close to Scotch malt whisky as they can make it. It's a unique chapter in the Canadian whisky story and fascinating story all around. I knew from the moment I read it that I wanted to try it. Never mind that the reviews were a bit tepid and mixed and the price was high. De Kergommeaux addresses the price a bit in "Canadian Whisky". Glenora is a small distillery that does much by hand. Their output is limited. Meanwhile there is plenty of curiosity and demand for this product - thus the high price. This item runs $87 at the Ontario Liquor Control Board and $100 at Park Avenue Liquors. The question of pricing is a different topic than whether it's good, however. I'm going to address what's in the glass. 2oz sampled at NYC's The Brandy Library. Nose: very shy with gentle notes of oatmeal porridge with salted butter, and a drift of marzipan. This evokes a powerful sense memory for me of the smell of how my father took his Cream Of Wheat porridge when i was a boy: with salted butter and cream. Its a warm and comforting gentle aroma. Deeper nosing reveals some slight acid and vegetal and floral notes. The palate entry is gentle and lightly sweet with a fresh floral meadow grassy vegetal sweet. There are notes of puff pastry with powdered sugar, and whipped cream. The midpalate expansion follows the gently creamy theme. Oats, sweet butter and half and half power through into the finish that had a few light herbal bitter notes almost as a faint afterthought. With extended air (over 30 minutes) the mouth feel riches and the buttery mid palate flavors sweeten into butterscotch caramel notes. Fruity flavors appear as well, gently floral and faintly sherried. It's shy but when it finally opens it's lovely. The addition of three drops of water does little to the nose except maybe to lessen it further. On the palate, however, there is a bit of acid bite in the fruit now that is a welcome development to help liven up the show. On the whole, however, I preferred the richer mouth feel and more buttery flavor balance of Glen Breton without water, so that's how I'll refer to it for the remainder of the review. I had it head to head with Mackmyra The First, which is simultaneously more floral and also more berry/grape acidic and minerally. But both share a similar light body and density of flavor. Glen Breton has a warmer and more savory palate with more simple butter and cream. It has less flavor amplitude but the flavors are appetizing, comforting, and harmonious. I give a slight edge to Mackmyra for it's more floral and effusive nose and greater complexity earlier on in the tasting - but these are very different drams and Glen Breton Rare is lovely when it finally opens. It's borderline 4 stars. Bottom line, this is a competent credible malt whisky which I enjoyed and have no problem recommending as an enjoyable tasting experience. However, at the current US pricing Glen Breton Rare 10 is in no way competitive with other whiskies at the $100 price point (or vicinity). Just no way at all. Update (30 minutes after initially posting): Bruce Fraser (@BruceFraser) of Nova Scotia reports that older bottlings of this were harsher and had a soapy flavor. This explains the poor ratings and complaints of soapy flavors in the LAWS web site reviews. Johanne McInnis (@Whiskylassie) confirmed: "...well, I was at the distillery two years ago, and tried it right from the barrels, PLENTY of soap!" However, this recent bottling was in no way harsh and had no off or soapy flavors whatsoever. My sole complaints were lack of density and high price. The flavors that were present were very nice, and became a bit better than nice with extra time. Please note that the price of the Glen Breton 10yo at the LCBO (liquor control board of Ontario) is $87 NOT $47. 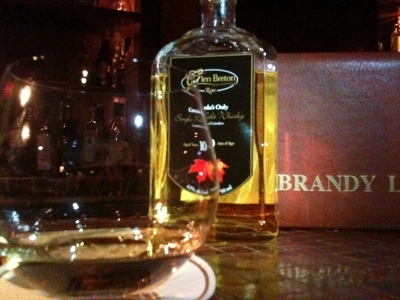 For $46 they offer a 250ml bottle of cask strength 17yo finished in ice wine cask. As the price at the LCBO shows, there is no national protectionism here. I bought a bottle of this last month and, as a Canadian, I reaaaallllly wanted to like it. Unfortunately, it's among the worst whiskies I've tasted since taking up the "hobby" two years ago. As far as I'm concerned, they can export all of it! Thanks for the correction on the price. My apologies I guess I wasn't careful enough in my reading of the listing. I've fixed it now. Thanks. That being said - sorry you didn't like it for $87! Check out Graham MacKenney's comment below about there seeming to be soapy and non-soapy versions cruising around at the current moment. I'm wondering which you got? Even with the crazy prices the LCBO charges for Scotch and Bourbon, there are plenty of other whiskies that are miles ahead in terms of consistent quality at lower price points. Better to spend $60-$70 on Forty Creek or $50 for Wiser's Legacy - to name just two quality Canadian offerings. As much as I would like to support a "craft" Canadian distiller, I for one will not be buying another bottle in the hope of getting one that is drinkable. Josh, great review. 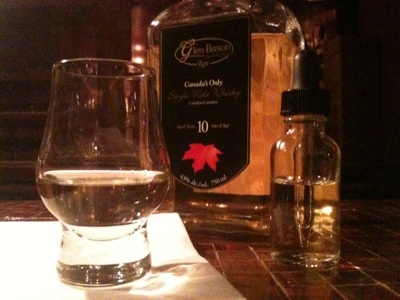 Unfortunately, as you mentioned in your review, Glenora/Glen Breton's early releases were very harsh and soapy and they ended up with a very bad reputation for making poor whisky. That reputation has followed them far and wide. As Johanne also confirmed, the soap is still alive and well in some of their current sleeping casks. Being a little slow to change here in the maritimes they will probably be stuck with that reputation for a generation or so. However; recent releases have been very good (I highly recommend trying their Battle of the Glen and their Ice Wine finish). The issue about price point they defend quite passionately and I truly believe this hinders their sales. I suspect that if they priced their product appropriately they could sell out every release and really create a cult following similar to Springbank (but who am I among so many?). As a further note to illustrate their close ties to Scotland, the Glenora Ambassador, Donnie Campbell told me the stills at Glenora came from Bowmore as well the set up of the distillation equipment and the first few runs were also overseen by a Bowmore rep or former employee. Despite how I feel about the flavor notes, I love the fact that Glenora exists and I will always root for "the home team!" Graham - thanks for commenting in with a wealth of useful information. Davin's book does a great job describing the saga of Glenora's stills - which include the error of sizing the wash still the same size as the spirit still. The whole story is just fabulous. The Bowmore connection is lovely too (especially since Bowmore has the rap that it's a bit too light in the flavor density for the price too). With any luck Glen Bretons will age up into some worthy drams like the mature Bowmores. That would really shut everybody up. As it is, I found enough going on in the sample I had to gratefully greet another glass if it comes my way. Bottom line - is it fine whisky? My answer is yes. The other questions (good value? advance the art?) are in a way secondary. I'm a bit in love with the concept that it's Scottish style malt whisky made in Canada. I was recently at the Glenora Distillery about a week ago. It has a 14yr and a 19yr that is available on site. I haven't had the opportunity to try it. I did get a dram of the Battle of the Glen at the pub and I really enjoyed it. I bought a bottle on the way out. Again though, price was high but it's quite the talking piece. I too had tried this whisky a few years ago and was not impressed in the least for the same reasons as others have commented. However, I enjoyed your open minded approach to this whisky and sounds like things are changing. Aside from the outrageous price point, maybe in a couple of years they can get their wood management decisions of today to result in a better whisky to come. As a Nova Scotian I have a very difficult time divorcing myself of bias when discussing Glenora's products. That said, my own 2013 bottle of the 10 YO expression seems free of any harsh or soapy character (though maybe I'm soap-blind). I definitely agree that the price point is problematic though; even here at home it costs $80 for a bottle. Last year's Fiddler's Choice NAS release is encouraging though. It's just 6 years old but seems to be a generally better whisky than GB Rare and is more appropriately priced at $60. Hopefully this means that cask selection has improved and future bottlings of the 10 YO will be of a quality more in line with the price. I also hope that Fiddler's will generate enough new revenue to allow Glenora to correct their still size issues. I've subsequently heard that the soapy thing was a start-up issue. It would explain why recent bottlings seem free of those flavors. Glad to hear about the Fiddler's Choice stuff. My hope is that they keep upping their game with time and experience. That's far more important than getting a larger beer still.